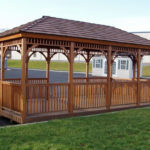 A wood gazebo will offer you plenty of hours of outdoor entertainment whether with the family, friends, or alone. It makes the perfect shelter, which can host all sorts of activities when the weather starts getting a bit better. Alternatively, you can get a fire pit and spend time outdoors even when it’s chillier. Not to mention what a great upgrade gazebos are. They won’t only offer the idea outdoor space for your family’s activities but also increase the value of your home. Who doesn’t need a place to relax or hold a kid’s party without making a mess in the house? Your gazebo will embrace all your needs. When you are trying to find gazebo design and build ideas, remember that you have many, many choices. 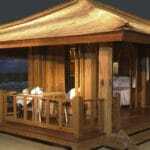 Traditionally, gazebos have a round shape, a roof and pillars symmetrically placed to provide support. Although gazebos stand out for their round/octagonal shape, modern designs include other shapes as well. And then again, you can combine gazebos with other outdoor structures or use decorative elements to make this the focal point of your backyard. A wood pergola will make a great pair with custom decks. They can be designed to match in terms of shape, wood species, color, and style. On top of that, you can install a deck railing system which will come handy if you have kids. An alternative idea is to lose the roof but keep the spherical, dome-like shape and use wooden beams instead. This idea is splendid should you want to place your gazebo near the pool and don’t want to block the sun. Having drapes hanging on all sides will provide extra shade but also extra glamour. Prefer white ones that will look great with the color of the wood and create a minimal style. If you want a more playful environment, get drapes in orange or green. After all, you can always change them to create a different ambiance. Although the traditional way of gazebo building is to have pillars and don’t cover the sides, you can still use cut-out designs for the sides either to let flowers grow or just to provide more privacy. Remember that your gazebo doesn’t have to have the color of wood. It can be painted white or another color of your choice. You can simply paint the inside surface of the roof or use two different hues in an attempt to make it a more modern wooden structure. In any case, you need to hire the best gazebo builders since such structures must be scaled to the garden to blend nicely with the landscape without risking your safety.